The diversity of gait deviations observed in children with Cerebral Palsy has led to repeated efforts to develop a valid and reliable gait classification system to assist in the diagnostic process, clinical decision making and the communication of a child’s presentation between clinicians. Gait classification allocates walking patterns into groups that can be identified and differentiated from one another based on a set of defined variables. Spasticity accounts for approximately 80% of all paediatric Cerebral Palsy presentations and of these children, 70% will achieve some form of ambulation. Hence, most of the research on gait classification has focused on children who present predominantly with spasticity. Winters, Gage & Hicks  first described a gait classification system for children with spastic hemiplegia. They identified four homogenous groups of gait patterns that are observed in the sagittal plane and also described the major muscle groups affected. Rodda and Graham  continued with this theme by including a sub-division for group two and suggested an Ankle Foot Orthosis (AFO) prescription for each of the groups. (FIGURE 1) In the Type IV group, Rodda and Graham also provided a description of the deformity in the coronal plane. The studies by Winters, Gage & Hicks  and Rodda and Graham  assisted the initial understanding of paediatric Cerebral Palsy gait. However, there are limitations to their clinical relevance and also to using them as a base for orthotic prescription. Dobson et al. found a low level of validity and reliability of the gait classification systems that were developed by Rodda and Graham  for both hemiplegia and bilateral lower limb spasticity. Both gait classification systems rely solely on the identification of sagittal plane gait disturbances and do not fully address the range and magnitude of gait deviations in children with Cerebral Palsy. Efficient walking relies upon the appropriate alignment of the lower limbs in all three of the sagittal, coronal and transverse planes. In both classification systems described by Rodda and Graham  they identified the muscles affected by weakness or spasticity for each group, including those that act in the coronal and transverse planes. Muscle weakness and spasticity introduce abnormal rotational deformities in the lower limbs and these are observed in the coronal and transverse planes. Truly effective orthotic intervention must provide tri-planar control of the foot and ankle while providing tri-planar support for weaker muscles. If tri-planar control and support is not provided, the function of the orthosis may be compromised and ultimately limit the benefits to the child. Therefore, these gait classification systems and proposed orthotic prescriptions have limited orthotic clinical applications. It will then focus on the different types of gait patterns found within these two groups. 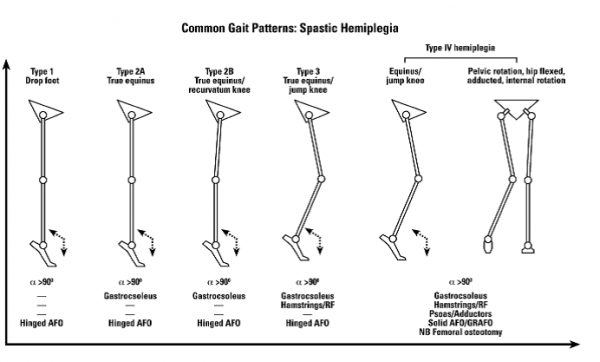 The most widely accepted classification of gait in spastic hemiplegia is that reported by Winters et al (1987). They subdivided hemiplegia into four gait patterns based on sagittal plane kinematics. The classification has direct relevance to understanding the gait pattern and management. inability to selectively control the ankle dorsiflexors during this part of the gait cycle. There is no calf contracture and therefore during stance phase, ankle dorsiflexion is relatively normal. In the experience of the original author of this article, this gait pattern is rare, unless there has already been a calf lengthening procedure. The only management maybe needed is a leaf spring or hinged ankle foot orthosis (AFO). Spasticity management and contracture surgery are clearly not required. Orthotic management may include a leaf spring or hinged AFO. 2a Equinus plus neutral knee and extended hip. There is usually a variable degree of drop foot in swing because of impaired function in tibialis anterior and the ankle dorsiflexors. A pattern of true equinus can be seen, with the ankle in the plantar flexion range through most of the stance phase. The plantar flexion / knee extension couple is overactive and the knee may adopt a position of extension or recurvatum. If there is a mild contracture, supplemental casting can be very effective. The majority of children will also require orthotic support, both to control the tendency to `drop foot‘. Once a significant fixed contracture develops, lengthening of the gastrocnemius and soleus may be indicated. Type 2 hemiplegia with a fixed contracture of the gastroc-soleus constitutes the only indication for isolated lengthening of the tendon achilles. If the knee is fully extended or in recurvatum, then a hinged AFO with an appropriate plantar flexion stop is the most appropriate choice of orthosis. A plantarflexion stop or posterior stop in an AFO is designed to substitute for inadequate strength of the ankle dorsiflexors during swing phase of gait. This stop is effective by limiting the plantarflexion range of motion of the talocrural joint. Older children with progressive valgus deformities are likely to become brace intolerant and require bony surgery. Type 3 hemiplegia is characterized by gastroc-soleus spasticity or contracture, impaired ankle dorsiflexion in swing and a flexed, `stiff knee gait' as the result of hamstring/quadriceps cocontraction. At a later stage, management may consist of muscle tendon lengthening for gastroc-soleus contracture. A solid or hinged AFO may also be helpful; the choice should be according to the integrity of the `plantar-flexion, knee-extension couple'. In Type 4 hemiplegia there is much more marked proximal involvement and the pattern is similar to that seen in spastic diplegia. However, because involvement is unilateral, there will be marked asymmetry, including pelvic retraction. In the sagittal plane there is equinus, a flexed stiff knee, a flexed hip and an anterior pelvic tilt. In the coronal plane, there is hip adduction and in the transverse plane, internal rotation. Management is similar to Type 2 and Type 3 hemiplegia, in respect to the distal problems. However, there is a high incidence of hip subluxation and careful radiographic examination of the hip is important. The adducted and internally rotated hip will usually require lengthening of the adductors and an external rotation osteotomy of the femur. Failure to address the hip adduction and hip internal rotation will usually mean that any distally focused intervention will fail and the overall outcome will be poor. Torsional deformities of the long bones and foot deformities are frequently found in bilateral spastic CP, in association with musculo-tendinous contractures. These are collectively referred to as `lever arm disease‘. The most common bony problems are medial femoral torsion, lateral tibial torsion, mid foot breaching, with foot valgus and abduction. Rotational osteotomies and foot stabilization surgery are often required, in association with the spasticity and contracture management. This shows the features of `lever arm disease'. There is an out-toed stance and gait pattern because of midfoot breaching and lateral tibial torsion. The right image is a sagittal view demonstrating a crouch gait pattern. When the bony lever (the foot) is both bent and maldirected, the already weakened gastroc-soleus is unable to control the progression of the tibia over the planted foot and a crouch gait results. When the younger child with bilateral cerebral palsy begins to walk with or without assistance, calf spasticity is frequently dominant resulting in a `true equinus' gait with the ankle in plantar flexion throughout stance and the hips and knees extended. The patient can stand with the foot flat and the knee in recurvatum. The equinus is real but hidden. A few children with bilateral cerebral palsy remain with a true equinus pattern throughout childhood and, if they develop flexed contracture, may eventually benefit from isolated gastrocnemius lengthening. The persistence of this pattern is unusual and seen in only a small minority of children with bilateral CP. Orthotic management: solid or hinged AFO. 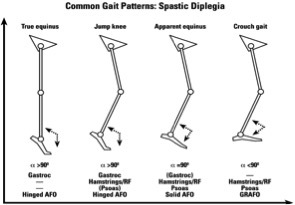 The jump gait pattern is very commonly seen in children with diplegia, who have more proximal involvement, with spasticity of the hamstrings and hip flexors in addition to calf spasticity. The ankle is in equinus, the knee and hip are in flexion, there is an anterior pelvic tilt and an increased lumbar lordosis. There is often a stiff knee because of rectus femoris activity in the swing phase of gait. In younger children, this pattern can be managed effectively by botulinum toxin type A injections to the gastrocnemius and hamstrings and the provision of an AFO. In older children musculotendinous lengthening of the gastrocnemius, hamstrings and iliopsoas may be indicated with transfer of the rectus femoris to semi-tendinosus for co-contraction at the knee. As the child gets older and heavier, a number of changes may occur which may render the calf muscle and the plantar flexion–knee extension less competent. Equinus may gradually decrease as hip and knee flexion increase. There is frequently a stage of `apparent equinus' where the child is still noted to be walking on the toes and simple observational gait analysis may mistakenly conclude that the equinus is real, when it is in fact apparent. Sagittal plane kinematics will show that the ankle has a normal range of dorsiflexion but the hip and knee are in excessive flexion throughout the stance phase of gait. Management should be focused on the proximal levels where the hamstrings and iliopsoas may benefit from spasticity treatment or musculotendinous lengthening. Redirection of the ground reaction vector in front of the knee can best be achieved by the use of a solid or a ground reaction AFO. Orthotic management: ground reaction (Saltiel) AFO, solid AFO or hinged AFO according to the integrity of the plantar flexion–knee extension. Crouch gait is always didifficult to manage and usually requires lengthening of the hamstrings and iliopsoas, a ground reaction AFO and adequate correction of bony problems such as medial femoral torsion, lateral tibial torsion and stabilisation of the foot. By the time it is recognised, the musculoskeletal pathology is usually too advanced to respond to intramuscular BTX-A. Orthotic management: long-term use of a ground reaction (Saltiel) AFO until the integrity of the plantar flexion- knee extension couple is clearly re-established. Ambulatory children with CP have various types of pathological gait. Efficient intervention depends on proper evaluation. Video recording can support observation and analysis but usually observation is the only way of evaluation. Computerised gait analysis is an objective, standardised, reproducible and quantifiable method to evaluate gait patterns. Although gait analysis has been shown to alter decision making, there is little evidence that the decisions based on gait analysis lead to better outcomes. Computerised Gait analysis is useful as a research and education tool. It is an additional aid in decision making for treatment. It requires expensive high technology equipment and educated staff. It shows how the child walks graphically but does not tell how functional the gait pattern is unless it measures the amount of energy consumed during walking. It adds little to the clinical examination and remains more a research tool than part of a routine clinical examination in most countries. Consequently, clinical gait analysis remains controversial. Other words used are braces or splints. Ortho is the Greek word meaning “to make straight”. The evolution of orthoses in CP: From metal and leather to plastic and carbon, with better understanding of the biomechanics; from KAFOs(knee ankle foot orthosis) to AFOs (Ankle Foot Orthosis) with ankle control. Orthopaedic shoes, KAFOs and calipers have largely been abandoned. They are cumbersome, have very limited mechanical advantages, are very difficult to don and doff and in many cases, they hide the deformity rather than correct it. Children with CP are prone to develop deformities of their limbs and spine because of unbalanced forces created by spastic and weak muscles and the effect of gravity (the interaction between all these factors is called biomechanics). Additionally, the muscles may struggle to lengthen in proportion to the growing skeleton, which can cause loss of the ROM at joints. Orthoses can be used to alter body posture in an attempt to prevent deformities and may make some activities easier. However, orthoses may also make activities as crawling, toileting and dressing more difficult. Careful assessment of the benefits versus any disadvantages of orthoses is often necessary. There are a confusing number of names to describe orthoses. The most common and simplest methods describes the parts of the body within the orthosis. Thus the AFO’s (ankle and foot orthoses) enclose the ankle and foot; KAFOs (knee ankle foot orthoses) additionally include the knee joint. WHOs (wrist hand orthoses) or EOs (elbow orthoses) are used for the arm. The names of people or places where orthoses where first used or commercial prodcut names are commonly used, as well with addition of terms like rigid or dynamic. One of the problems seen in children with CP is an equinus or tiptoe posture (plantarflexion) of the foot and ankle, caused by spasticity or tightness of the calf muscle. This often causes also changes to the flexible structure of the ankle and foot, making the foot roll inwards (valgus) or outwards (varus). AFOs can be used to restrict ankle movement and prevent the foot from plantar flexing. AFOs are made by an orthotist. Research suggests that stretching of the calf muscle at least 6 hours of the 24 hours is necessary to prevent them from becoming shortened. So, with manual stretching you will never be able to stretch for such a long time per day…. If the aim is improvement of functioning: the orthosis must surely be worn during daily activities. Some recommend wearing at night when maintaining range of movement is the primary goal but only when is does not disrupt normal sleeping patterns. A common practice is for school children to wear the orthosis during time spent at school but not at home. Using an AFO to prevent plantarflexion improves stability in standing and walking, positioning of the foot and clearance of the swinging leg during gait, and so reducing energy expenditure and increasing step length and walking speed. For children who are not walking, maintaining good position will enable more comfortable posture in seating systems. Using hinged AFOs allows partial movement which makes climbing stairs and inclines slightly easier. The disadvantage can be that the child may flex the hips and knees excessively and sink into a crouched posture. So, when the AFO has to assist knee extension during standing and walking, the AFO must be very rigid. There is no evidence to support any tone reduction effect from orthoses that incorporate specially moulded footplates. Some children walk with their feet pointing inward and others with the foot turned outwards. This often is caused by foot posture in combination with rotational deformities in the long bones of the leg (femur and tibia). Using a HKAFO (hip knee ankle foot orthosis) may gain some rotational control of the leg but the bulkiness of the orthosis may make walking more difficult. Pelvic rotation, when the child leads with the less impaired limb during walking, is part of the neurological problem and cannot be influenced by orthotic management. Rigid AFO’s – where the intention is to block ankle movement in every plane. These may be used in neuropathic conditions to prevent deformity or provide a rigid support to assist stance. Flexible AFO’s– where the intention is to assist the movement of the foot and ankle in one plane while restricting it in another. These AFO’s are designed to flex in use. A very common example is the drop foot splint where the orthosis is designed to aid dorsiflexion to avoid ‘foot drop’. Hinged AFO’s - These are designed to permit a limited ROM on a single plane, i.e. they permit plantarflexion or dorsiflexion within limits fixed by the hinges, while blocking or attempting to block inversion and eversion. These are used, for example, in situations where there is varus or valgus instability but where it would not be advisable to completely block dorsiflexion or plantar flexion. The primary intention may be to simply block the ROM at a specific point. NB These can only be effective when the patient has useful range of movement. The indications of bracing in the shoulder and elbow are very limited. There is no good evidence to support claims that wrist hand orthoses prevent or correct deformities and improve manual ability over time. Usually they are used to stretch spastic or tight muscles in combination of botulinum A toxin injections and serial casting, or they are used to maintain range of motion. 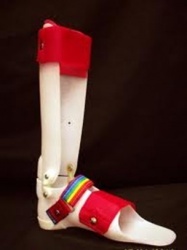 An example of a functional splint is a McKie splint which allows for better grasp and functioning. This type of splint is used in everyday activities. This website has information on the use and measurement of a McKie splint. If the orthosis is solely required to stretch the wrist, fingers and thumb, it should only be worn during resting periods. Botox injections: popular since some years. Injected in some muscles in the leg. Can reduce spasticiy (because is causes temporary weakness. But only short time effect (some months) so have to be repeated regularly. Orthopaedic surgery: muscle and tendon release to improve range of movement and improved sitting and walking. It is the best choice for fixed deformities. But the disadvantages can be permanent like permanent muscle weakening, risk of overlengthening and often the surgery needs to be repeated because it does not decrease spasticity. Percutaneous muscle/tendon release has less risks (like overlengthening or muscle weakening), requires no casting. It needs careful evaluation and often is combined with selective dorsal rhizotomy. Baclofen pump: a pump is put into the abdomen of the child and baclofen is pumped in the muscle. No cutting and it can reduce spasticity. But there often are complications, the maintenance of the pump often causes problems and through operation the pump has to be replaced periodically. If stopped the spasticity returns. Selective dorsal rhizotomy (SDR): neurosurgical procedure to reduce spasticity. Only for those who have the potential for functional gain. Optimal age is 2-5 years, but also when older they can gain function. Spasticity is reduced, especially in children with hemiplegia and diplegia. In quadriplegia there may be no results though. Functional movements can be improved (crawling, sitting, walking) but depends on age, muscle strength and severity of spasticity. It may prevent future surgeries because less deformities will develop, especially for children who walk independently after the SDR. Otherwise it still can be needed. SDR does not improve fine motor skills although it can improve range of movement of the arm. GMFCS level: I, II or III. SDR can only be done by specialists after rigorous assessment. There is not one single operation or orthosis or treatment to improve walking and mobility. AFO’s do not prevent deformities and contractures but may make walking more comfortable and stable. Operations may be necessary to improve functioning (e.g. standing, walking) or make it easier for parents to take care of the child (if there is contracture of the adductors of the legs). Careful assessment is necessary before decisions are made about operation and medication and use of orthosis. There is still a lot not known about the effectiveness of operations and AFO’s. 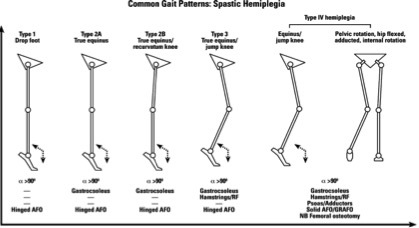 ↑ Winters TF Jr, Gage JR, Hicks R.Gait patterns in spastic hemiplegia in children and young adults. J Bone Joint Surg Am. 1987 Mar;69(3):437-41. ↑ Corry IS, Cosgrove AP, Duffy CM, Taylor TC, Graham HK. Botulinum toxin A in hamstring spasticity. Gait Posture. 1999 Dec;10(3):206-10. ↑ Sutherland DH, Cooper L.The pathomechanics of progressive crouch gait in spastic diplegia. Orthop Clin North Am. 1978 Jan;9(1):143-54. ↑ Borton DC, Walker K, Pirpiris M, Nattrass GR, Graham HK. 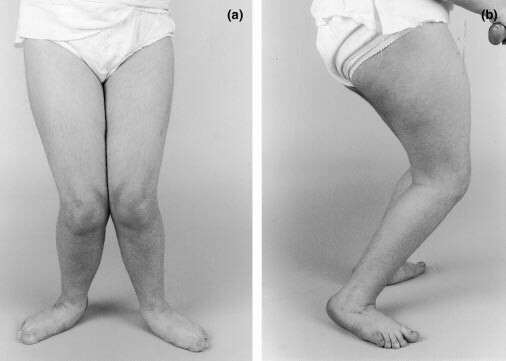 Isolated calf lengthening in cerebral palsy. Outcome analysis of risk factors. J Bone Joint Surg Br. 2001 Apr;83(3):364-70. ↑ Miller F, Bagg MR. Age and migration percentage as risk factors for progression in spastic hip disease. Dev Med Child Neurol. 1995 May;37(5):449-55.